It has been a long time since I have reviewed a good Olloclip product, and I would love to say they are the best of their type. Seriously, I am not certain if any company makes such great lenses for smartphones, particularly iPhones. I was pretty glad to review their latest product for the iPhone 7/7 Plus with the Olloclip Core Lens Set. Most of the time, the Olloclip products are made for specific sizes of iPhones, but the Core Lens Set is made for both the iPhone 7 and the iPhone 7 Plus at the same time. So no matter what one you have, you can use it. 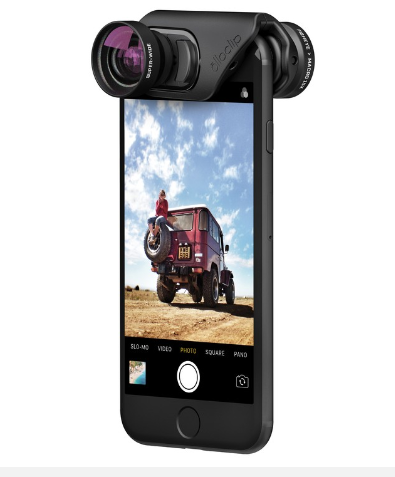 If you aren’t familiar with Olloclip products, their latest models have been able to snap on the top of the iPhone, and then you have improved camera action. In this case, the Core Lens Set has a lot of lenses for it. One of them is a Super-Wide with over 120 field-of-view, and so you can capture a lot of width with your shots. Another is the Macro 15 X with 15 X magnification, and you can attach a Fisheye with a spherical effect. What is interesting is how you can insert these lenses with a spring-loaded snap-in, and I wouldn’t be surprised if their Connect Lens system is patented. It is unique, but it is so unique that you might see it on some other product. Best of all, you can mount a lens and then flip it to the lens on the other side. It is highly convenient. What is also convenient is how the Olloclip has a necklace mount and a clip as well. This pendant stand can be opened up and then used as a pocket-sized tripod, which is just even more cool! If you don’t believe me, check it on your right! In short, this is one of the greatest lens holders for an iPhone that there is! 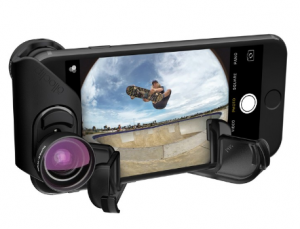 You should be able to purchase it on the Olloclip site for $99.99.